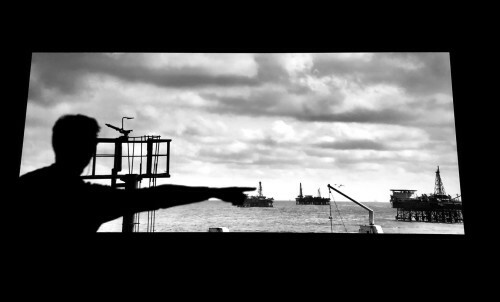 April: Spoon by Laila Pakalnina: A film about a plastic spoon and a society that has reached a high level of development – oil is being retrieved from subterranean depths, transported to processing plants, turned into plastic, transported to another plant, where it acquires the shape of a spoon, transported to convenience stores, where we buy it, and is then soon tossed into the trash. In other words, this is a film about the efforts put into making a spoon that can be thrown away so effortlessly. December: Finalizing music for Spoon by Laila Pakalnina, a close up on the horrific production of plastic and the use of it. To be aired in 2019.
aren’t visible in Norwegian media. March-: Spoon by Laila Pakalnina – composing music for a new film about a plastic spoon and a society that has reached a high level of development. February 2: «Hva er status»; – Something is wrong in the Norwegian art world, do I claim, fighting structural racism in the art world. January 25: Delivering a speech at Buskerud kulturkonferanse 2018 i Kongsberg: On institutional racism in the art world. November 22-24: Art fundings - Arts Council Norway: Counselor for the music section. October: Art fundings - Nordic Culture Fund: Counselor for the music section. September-December: New semester at Gateway College: Teaching Philosophy and Art of History. September 7-8: Art fundings - Arts Council Norway: Counselor for the music section. September 28: Participating at Trondheim Chamber Music Festival’s debate on music and politics. In cooperation with Ny Musikk Trondheim, Adresseavisen, Dokkhuset Scene and Luftforsvarets musikkorps. at Nordic/Docs Festival in Fredrikstad, Norway. 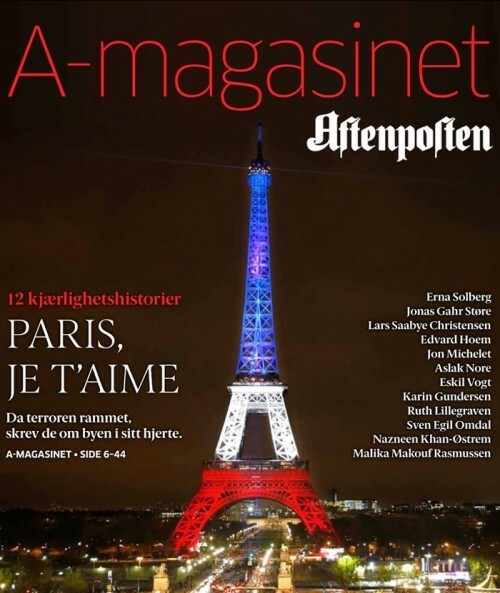 To air at ARTE, NRK, SVT among others. May 02-19: Art fundings - Nordic Culture Fund: Counselor for the music section. Club Montmartre is Malika Makouf Rasmussen’s new club concept, that had its debut at Vossa Jazz in April! The project is inspired by and based on the striking area Montmartre in Paris, where Malika resides. As a mingling spot for people from all corners of the world, Montmartre has historically been a melting pot and canvas for a community with a great appetite for art. Incorporating a variety of African and Western instruments blended with electronic sounds forms the sole foundation for Malika’s music. In Club Montmartre, the cultural surrounding in Montmartre is the inspiration and has become the focus point for a dynamic stream of influences, through different instruments, electronics and vocals. The furniture at the Zita Hotel is worn out, the varnish on the reception desk is coming off and the electrical system is about to break down. Silence prevails, until five people suddenly meet in this lonely hotel, far from everything. What is bothering Zita, the spontaneous and colorful cabaret singer? The grumpy writer Sisco writes his diary in deep concentration. What happened in his life since he refuses to show the diary to anybody? Why does the new, elegant but unpleasant guest Albin have all these thoughts of revenge on his mind – and a gun in his luggage? Romantic, naive Mercedes has no suitcase at all when she books a room for one or two nights. She easily starts to cry and doesn’t want to live anymore. Confrontations between the four are inevitable, and during a few intense hours, the truth about their lives comes out. 02-19: Art fundings – Nordic Culture Fund: Counselor for the music section. CLUB MONTMARTRE set to premiere at Vossa Jazz on april 7! I’ll be playing gimbe, bass and percussion. 01-02: Arts Council Norway – member of Faglig utvalg for musikk : funding art/music projects. Meetings takes place in Oslo. 02-30: Art fundings – Nordic Culture Fund: Counselor for the music section. 29-30: The Nordic Culture Fund meeting in Paris : New fundings in progress – content to be launched soon! Limbo - recordings. 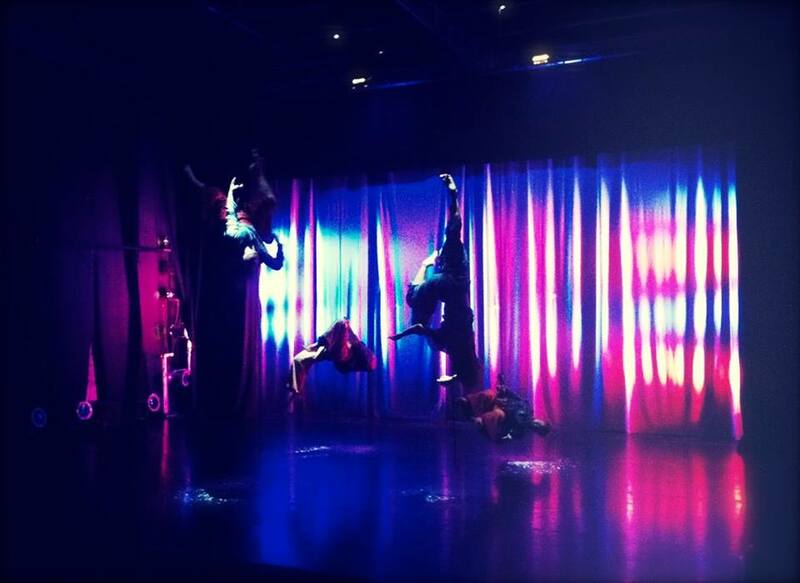 New piece by Tabanka Dance Ensemble, Art direction and coreography by Thomas Talawa Prestø. The piece raises questions around identity, integrity and belonging. What can your body tell us? To premiere 2017. Recording music for The Other Jerusalem; A documentary on the The impact of Israeli settlement and settlers on Palestinian land and water – by PeÅ Holmquist and Suzanne Khardalian in co-production with Hege Dehli, Mechanix Film AS, music by Malika. 01-29: Curator and producer for Global Oslo Music‘s annual festival Global Nights. 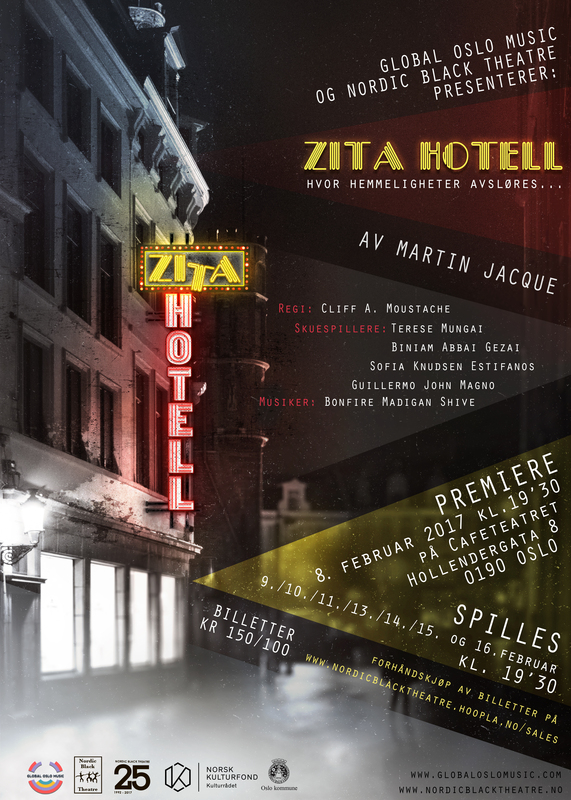 27-27: Studio recordings/sound design for Zita Hôtel, a musical theatre piece written by Martin Jacque. To premiere in February 2017. 02-29: Art fundings – Nordic Culture Fund: Counselor for the music section. 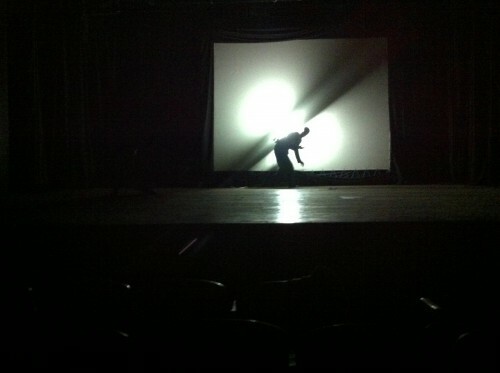 Preproduction: San Francisco Auditorium part II; visual arts and music. 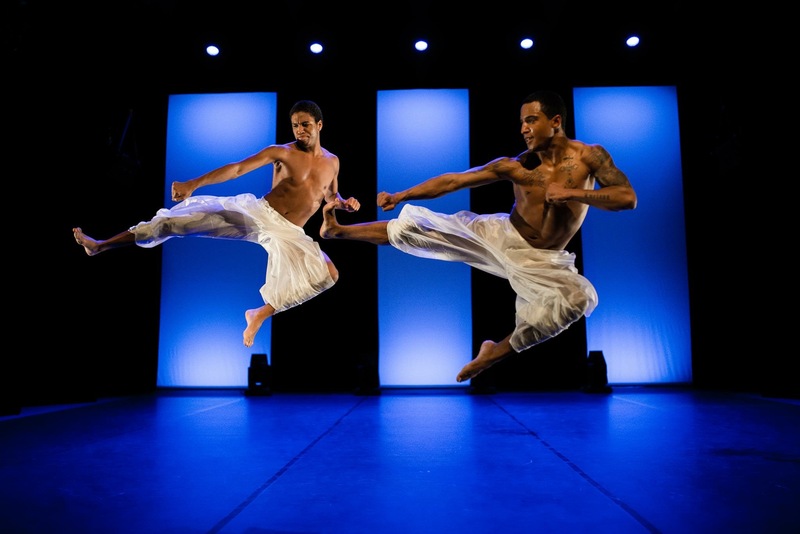 The piece embraces hybrid musical and visual identities. Its very essence is the incorporation of various cultural traits as a challenge to the myth of singular and absolute representation. 10-11: Arts Council Norway – member of Faglig utvalg for musikk : funding art/music projects.. Meetings takes place in Oslo. 08-: The making of a new documentary film The Other Jerusalem; On the The impact of Israeli settlement and settlers on Palestinian land and water – by PeÅ Holmquist and Suzanne Khardalian in co-production with Hege Dehli, Mechanix Film AS, music by Malika. 04-08: Visiting Reykjavik, Iceland: Research for the part II of San Francisco Auditorium – please check back for updates! 02-28: Art fundings – Nordic Culture Fund: Counselor for the music section. 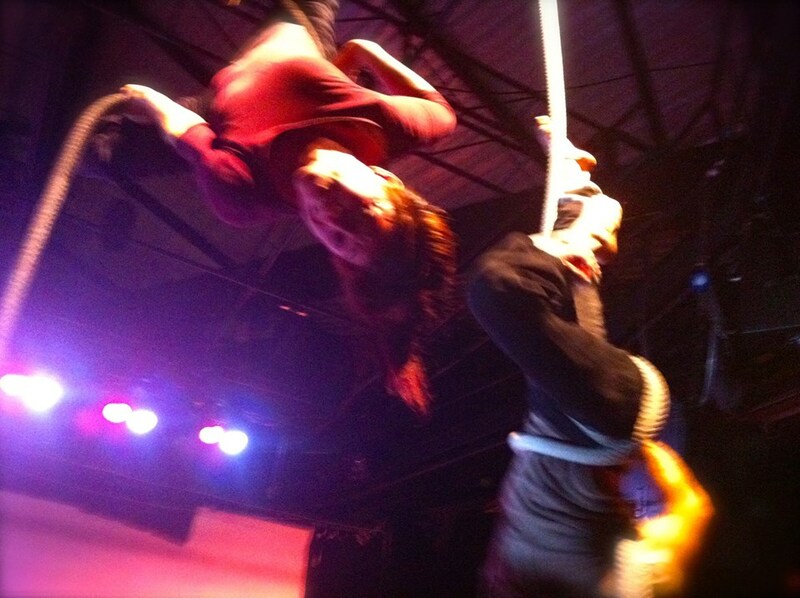 22-31: Tabanka Crew in Paris; the making of the new piece Limbo - preproduction. 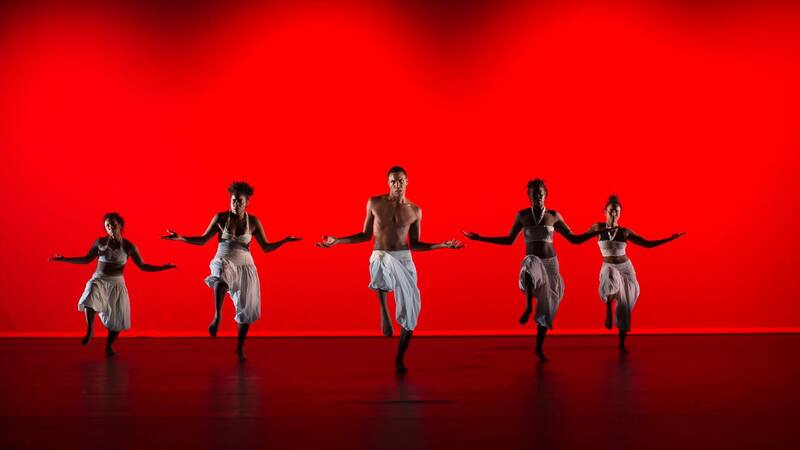 Performed by Tabanka Dance Ensemble, Art direction and coreography by Thomas Talawa Prestø, music by Malika. The piece raises questions around identity, integrity and belonging. What can your body tell us? To premiere 2017. 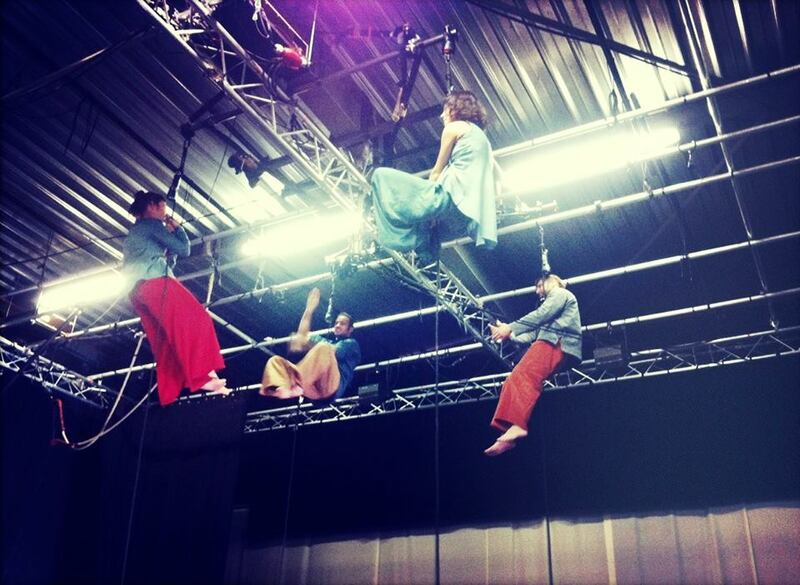 November-December: Rehearsals for the new piece Entre deux: a multi-disciplinary piece on duality containing circus arts, music, sound design, dance and video arts. 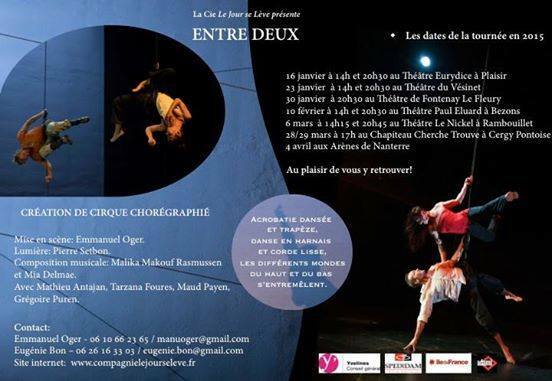 Written by Tarzana Foures, Maud Payen, Mathieu Antajan, Grégoire Puren and Emmanuel Oger. Music by Malika and Mia Delmaë. Premiere set to January 2015. Produced by Le jour se leve. 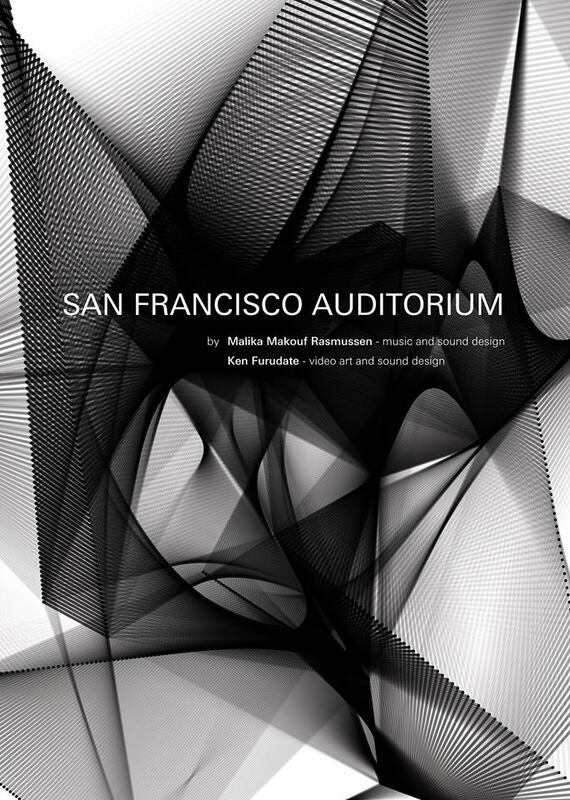 October 11: Global Oslo Music presents the premiere of San Francisco Auditorium by Malika; music and sound design, and Ken Furudate; video art and sound design. In 2013 Malika met the international touring renowned artist, programmer and designer Ken Furudate (Kyoto) in Tunisia. 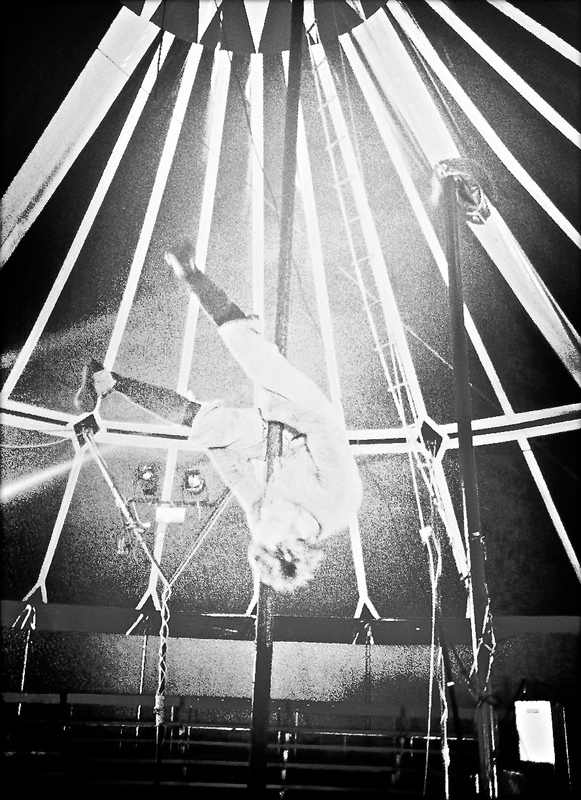 « San Francisco Auditorium » is the result of a fruitful artistic encounter that took place between them. 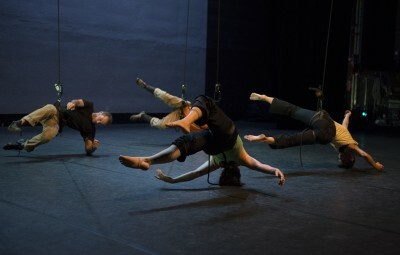 The piece embraces hybrid musical and visual identities. Its very essence is the incorporation of various cultural traits as a challenge to the myth of singular and absolute representation. among those: Ablaye Cissoko, Women’s Voice, Kouame Sereba, Steinar Ofsdal, King Ibu, Ali Fraka Toure, Olav Torget, Unni Løvlid, Haddy N’jie and Rolf-Erik Nystrøm. In Paris he will present music from his acclaimed album Sibi, featuring Malika strings, percussion) and Murielle Lantignac (vocal). July: Work in progress in Nanterre, Île-de-France: Circus arts, music, sound design, dance and video arts in the new piece Entre deux by Tarzana Foures, Maud Payen, Mathieu Antajan, Grégoire Puren, Emmanuel Oger, Malika and Mia Delmaë (music). To premiere January 2015. April-June: Preproduction and finalizing the San Francisco Auditorium project. April 4-6: At The European Independent Film Festival as a member of the Women-In-Film-In-Music team: A network and blog for persons interested in film, music and the role of women in the business of entertainment. This includes producers, directors, technical specialists and performing artists in the film and music industries. The key objective of the blog is to be a source for networking, understanding and acting on issues and barriers for the success of women participating in film and music. October-: San Francisco Auditorium in progress. 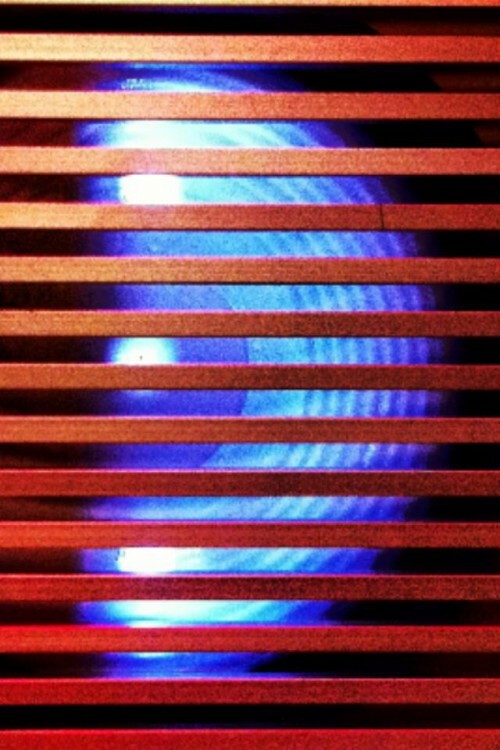 The piece – consisting of music, sound design and video art – crosses over a variety of techniques, characterized by elements of traditional instruments from the Maghreb region blended with electronic sounds. Arabic cultural symbols are present in the visuals. The clip below is a sample from the piece in progress. In collaboration with Ken Furudate. To premiere in 2014. September 21 and 28: Guest performances at the theatre Les rendez-vous d’ailleurs, 109 rue des Haies, 75020 Paris, hosted by Murielle Lantignac. 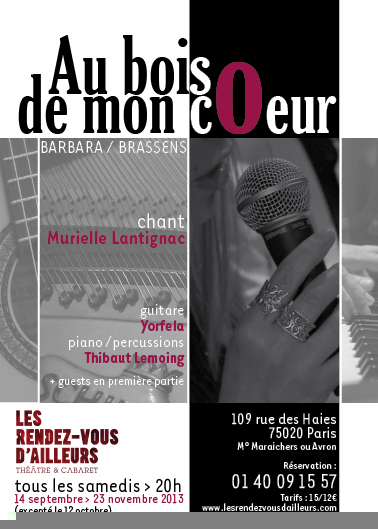 Every Saturday from September 14 to November 23, Murielle will be performing chansons by famous Barbara et Brassens in her show Au bois de mon cOeur. Every show has a guest appearance, leaving the stage open to any expression. Malika will be presenting various samples of previous work and work in progress. June 15: Staging Global Oslo Music 5th Year Anniversary Celebration: Along with Becaye Aw, Ablaye Cissoko, Murielle Lantignac, Safaa Al-Saadi, Ketil Kielland Lund, Øystein Bergsvik. April: In San Francisco doing research for the piece San Francisco Auditorium in progress. Photo taken at Sunday at Stanford: Interactive works exploring resonance and reverberation by students at Stanford, SF. 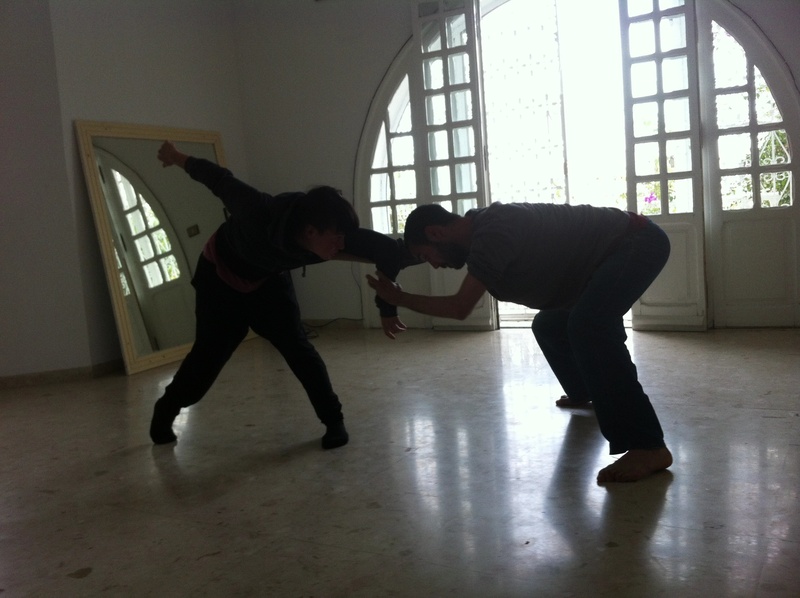 March 19-29: At work in Tunisia: The Konn project in progress -in collaboration with Meher Debbich Awachri (performing artist), Karolin Kent (performing artist), Ken Furudate (video and sound design) and Maison des Arts (producer). In this work questions around nothingness will be raised, such as: What is the meaning of nothingness in humanity and when are you nothing/something within society? 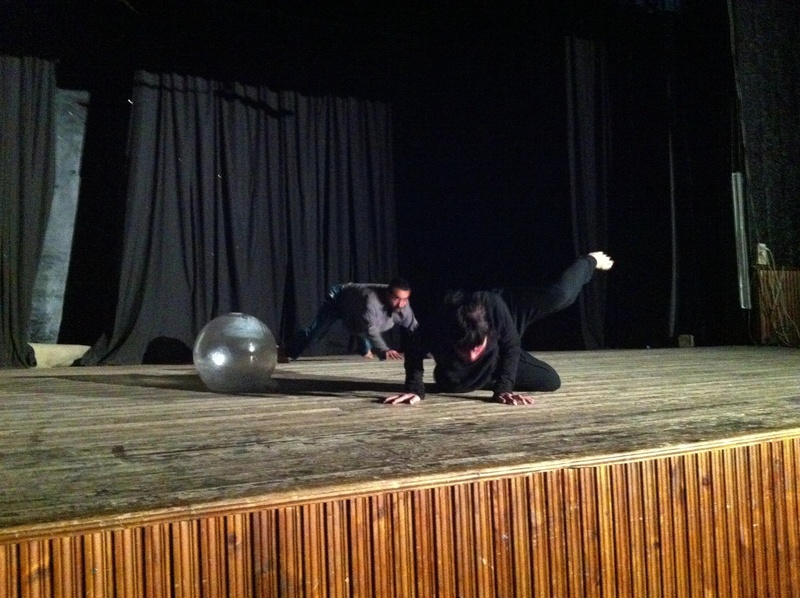 To premiere April 4-6 at 7.00 p.m. @ Mad’Art – Centre Culturel de Carthage, Tunis.